I was able to sneak out of Coffee Fest last weekend for a few minutes to check out a couple Seattle coffee shops. My first stop was Seattle Coffee Works. 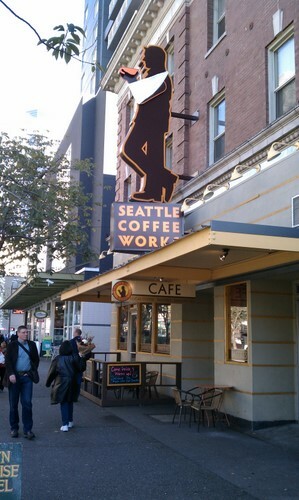 Located near Pike Place Market and across the street from the first Starbucks café, Seattle Coffee Works catches your eye with its distinctive sign outside and then it catches your taste buds with its interesting coffees. The café has an espresso bar and a “Slow Bar” for those who are interested in a pour-over or vacuum pot of coffee. A blend of Brazilian and Indonesian beans were “on grind” along with a direct trade single-origin Guatemala (or El Salvador?). My second stop was Stella (not to be confused with Spella in Portland). I had been told that Stella has a 100% Robusta espresso blend that is the best in the city. Unfortunately, I went there about 5pm and—take note other late-afternoon coffee drinkers—Stella closes down its espresso bar at 4pm. The barista told me to come back Saturday after 10am. 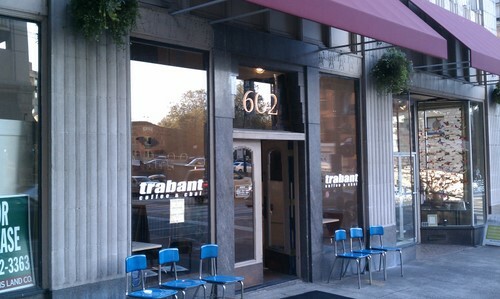 Disappointed, but determined to take advantage of my time in Seattle, I wandered down to Trabant on 2nd Ave. I tried their blend of 60% Ethiopian and 40% Costa Rica. It was bright, almost tart. I thought about trying some ‘Clover coffee.’ Trabant is one of the two places in Seattle outside of Starbucks (the other is Aster) that has the Clover, a single-cup brewing machine that is supposed to make great coffee. A friend of mine actually said that the Clover brewed the best cup of coffee he had ever tried. As is usually the case, though, I was in the mood for espresso and Trabant’s did not disappoint me. 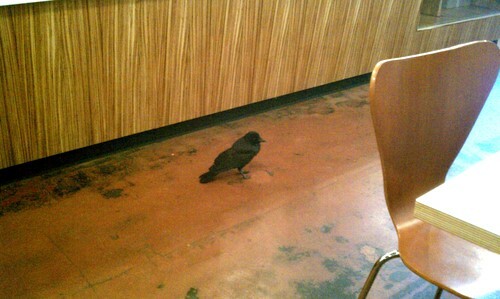 The most interesting thing that happened while I was sitting down in the café was that a crow decided to fly in and park itself on the floor next to my table. After a minute or two, it decided to fly back out the front doors. Seattle seems to have very civilized crows. Saturday, after lunch at DeLaurenti, I walked over to Stella once more. To my chagrin, they were closed. Apparently they had to get ready for the Halloween party that night and weren’t going to open until 3pm. After my class on Italian espressos, I was really looking forward to trying Stella’s blend. I will hopefully have a little better luck the next time I make it to Seattle. I wasn’t about to go without coffee, though—not in Seattle and not during Coffee Fest. Instead of going to one of Seattle’s signature cafés to buy a single espresso, I headed back to Coffee Fest and had three—one each from Caffè d’Arte, Caffè Vita and Carraro. That’s one of the perks of attending Coffee Fest—you can drink all the coffee you would ever want to at one time. As you might imagine, after the show was over for the day, I floated over to the bus stop.